In 1996, at the height of both their careers, writer and director Quentin Tarantino teamed up with his friend and director Robert Rodriguez to deliver a surreal horror film that shocked the censors and wowed the critics. The film was not the commercial smash the studios had hoped for but it has gained a huge cult following over the years, and rightly so. 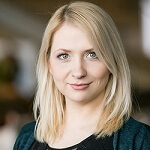 With huge names like George Clooney, Harvey Keitel, Juliette Lewis and even Tarantino himself appearing in the movie, it certainly held appeal for many film fans. The film’s 20 year anniversary just rolled around last year and it seems this is what triggered famed slot developer Novomatic to approach film Studio Miramax for a licence to develop casino games based on the film. This shrewd business move will also benefit from the recent interest in the film generated by the television series, also directed and developed by Robert Rodriguez. Even though the exact details of the deal between Novomatic and Miramax has not been revealed, we do know that Novomatic will be licensed to produce multiple slots based on the film so we could see some out of the box thinking from the developer to try and get as much value from this deal as possible. The film is not the easiest concept to convert into a slot game. One of the biggest challenges will be turning the R rated concepts form the film into an all ages slot game. There will have to be cuts of the most iconic scenes due to the violence and gore present. The film is essentially split into two halves, with the start of the film being a combination of road trip movie and hostage drama. In the second half, things get allot more surreal and horror inspired so this duality could potentially be put to great effect in the slot game. We have seen a few slots recently make use of a dual reels feature where you either have two sets of reels onscreen at all times or where certain actions can trigger the slot to reveal a new set of reels that players can enjoy for a set period of time. 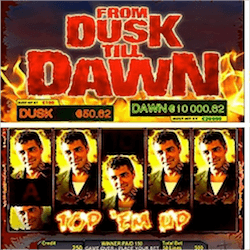 The Dusk Till Dawn slot games will first be released in land based casinos and will be revealed to the public at the Las Vegas Gaming Expo to be held next month. Chief Technical Officer for Novomatic Thomas Graf stated that the cult film will be combined with Novomatic’s world class slot technology to produce a slot game that will do the film justice and will please fans.